2007 Maserati Quattroporte Sedan. Clean Title. COMES WITH THE FULL AUTOMATIC TRANSMISSION. 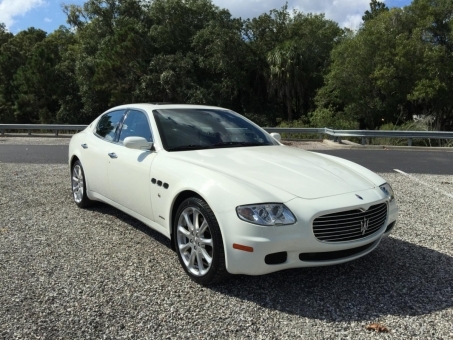 This 1 Owner Maserati Quattroporte is a Rare Color combo -White Exterior over the Black Leather Interior with white stitching which really sets this one apart from the rest!! I have the Manual books and 3 sets of keys for it, It is Fully Loaded Including Wood grain on the steering wheel, Black Suede headliner, 5 Disk Cd Changer, Navigation, Power Sunroof, power seats, Heated Seats, Alarm, ice cold a/c! This Maserati is in Excellent condition inside and out! We are interested in making our vehicle auction better by offering you the widest range of auctions types. Buying a used car has never been so easy, especially when you know exactly what car to choose from our greatest number of car offers. Repoautoauctionhouse.com gives you the opportunity to take part in public car auctions, police car auctions, state auctions, classic car auctions, military auctions or salvage car auctions. Moreover, our service has an advantage, which help you to find auto auctions near me, as Houston auto auction, gsa auto auction, Richmond auto auction, San Diego auto auction, auto auction Phoenix, NJ auto auction, auto auction Baltimore and so on. Repoautiauctionhouse.com is a car trading website designed for making your car deals fast and secure. With us you can purchase a new car and get it in shortest time. Moreover, you can sell your old car and our team will help you to do it. Forget about stressful situations while buying or selling a car, as we guarantee you'll do it without any obstacles. We care about you and your cars!